The IT History Society was formerly known as the Charles Babbage Foundation. For its first quarter century, CBF's mission was to support the work of the Charles Babbage Institute, a historical research and archive center focused on the history of computing and information technology, located on the campus of the University of Minnesota in Minneapolis. With CBI well established and doing excellent work, CBF broadened its mission in 2002 to support the entire IT history community. In 2007, CBF changed its name and reworked its programs to better support the IT history community. CBI was the brainchild of Erwin Tomash (CEO of Dataproducts). Early founding members included Gene M. Amdahl, Kenneth H. Olsen, Sam Wyly, and later Noble Laureate Joshua Lederberg and distinguished historians I.B. Cohen and Alfred D. Chandler, Jr. Over the years scores of trustees came from many hardware, software, services, and venture capital firms, joining with academics from such distinguished universities as Harvard, Michigan, Carnegie Mellon, and Minnesota. 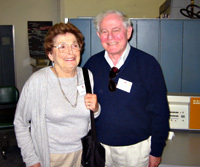 Tomash and his colleagues established the Charles Babbage Institute in 1978 for the purpose of collecting archival materials, training historians of computing, and conducting academic research. In 1980-81 CBI moved to the University of Minnesota, while a newly created foundation—CBF— focused on fund raising and advising the institute. Throughout the 1980s CBF raised funds in support of CBI’s activities, creating what ultimately became known as the Tomash Fellowship which has supported the Ph.D. research of nearly 30 young scholars and counting ; funding various history conferences devoted to computing; financing the CBI-Tomash reprint series of seminal works in computer science and history; and endowing a professorship-director’s position at the University of Minnesota , named “The ERA Land-Grant Chair in History of Technology.” CBI’s founding director, Arthur Norberg, was the first holder of the chair, beginning in 1989, and the present CBI director, Thomas Misa, is the current holder. During the 1990s, CBF continued to raise funds for CBI, making it possible for the institute to gain a solid financial footing and develop into the world’s leading center for the preservation and study of the history of information technology. In 1998, a task force of IT executives and scholars hosted by CBF led to a series of initiatives by CBI expanding its study of the history of software, helping create a productive research agenda for CBI and the wider computing-history field . Around 2000, CBF broadened its mission to support the history of information technology through other organizations, collaborating, for example, with the Sloan Foundation, Software History Center, and the Computer History Museum in experimenting with Internet-based archival and historical research. It also advised historians, promoted collaboration among academic organizations and museums, and raised funds for scholarship. In recent years it also assisted or advised IT corporations in preparing their own histories.